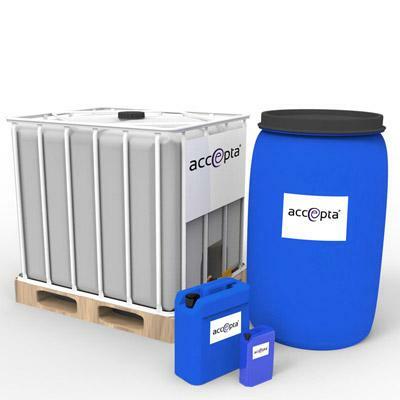 Accepta 2069 is a high-performance membrane cleaner scientifically formulated for the cleaning of reverse osmosis (RO) membranes and ultrafiltration (UF) membranes. Accepta 2069 is a liquid blend of dispersants and inorganic builders with an amphoteric surfactant and is specially formulated as an alkaline cleaner for removing organic debris and bio-fouling from RO and UF membranes. Accepta 2069 does not contain any amino carboxylic acid sequestrants. During normal operation, reverse osmosis and other membranes can become fouled, which greatly reduces the efficiency of the system. Deposits build up on the membrane until they cause a reduction in normalised permeate flow, increases in differential pressure and losses in salt rejection. The effects of fouling can lead to poor water quality, loss in production, unscheduled downtime and premature membrane replacement. A regular maintenance and cleaning programme can provide a significant return on investment by extending system run time, preventing membrane degradation, maintaining lower feed pressures and extending the membrane’s life. Accepta 2069 should always be used as recommended by the membrane manufacturer with respect to pH, temperature, flow rate and differential pressure.